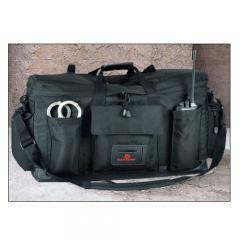 DeSantis crafts their line of gear and fine accessories with the law enforcement officer in mind. The R85 Recruit Bag features everything needed for toting essential duty gear around. The bag is crafted using a heavy-duty synthetic fabric that resists damage from scrapes and water, ensuring the pack will withstand daily wear and tear for lasting service life. With a variety of pockets, the Recruit provides ample storage space for organizing equipment, while the Velcro® and zipper combo closures guarantee secure retention of contents. The main compartment of the R85 can be locked employing dual zippers, further safeguarding valuable items. A padded shoulder strap and leather-wrapped handles offer convenient and comfortable carry options. Loops along the top accommodate a standard baton and an ID insert is available for quick identification. Stash the R85 Recruit Bag in the front seat of patrol cars and you're good to go!